A question I received: If this world is imaginary, does that mean that all our actions in this world have no connection to the goal of creation? My Answer: No, because you have to function, support yourself, and build your life in our world in order to exist. In order to reach the spiritual world, you must first become disappointed with your corporeal existence. This will make you think about how to perform a spiritual action, and you will then begin to connect your life in this world with spirituality. Your whole existence here will then be directed at developing the soul. Everything you do in this imaginary world will become spiritual. Consequently this world will disappear, since you will have retrieved everything you need from it for your eternal state. It disappears because it dissolves completely and wholly in the process of assisting the point in the heart. This constitutes this world’s correction. However, it does not change in and of itself, since it is incapable of acquiring the quality of bestowal directly. Our protein body and physical matter cannot exist for the sake of bestowal. Although all of its components on the inanimate, vegetative, and animate levels give to each other for the sake of leading a common existence, they don’t do this consciously. However, if I use this whole world in order to exist so I can develop my soul, I will thereby utilize this world in the correct manner and will fully deplete it. The other levels of nature (inanimate, vegetative, and animate) are unconsciously connected to each other with a global and harmonious connection. Meanwhile, human beings use these levels, including their animate selves, in order to perform an action of bestowal in the soul on a higher level. A human being thereby elevates the whole corporeal creation along with himself. One does not need to correct the inanimate objects, plants, or animals in nature; they are already corrected. Rather, while existing in the animal body, a human has to use only what is essential for him to live, and to direct everything else to correcting the point in the heart. Then everything on the inanimate, vegetative, animate, and human levels of this world will be in balance with the spiritual level. It turns out that the inanimate, vegetative, and animate levels are mutually included in each other and are controlled by the Creator, without their personal intention. We humans must also provide our animate bodies with everything necessary for them to exist for the sake of spiritual development. Our animate bodies are already prepared for us to use them in a spiritual form. We cannot make our bodies bestow, and we cannot change its laws. However, while it exists on the inanimate, vegetative, and animate levels, we can add an intention of using it the right way – for the existence of the body and the development of the soul. That way, it participates in the whole correction. With this kind of attitude on our part, the whole of creation will reach perfection and correction. Consequently, there isn’t a single part of the desire, even in this imaginary world, that does not undergo correction. Unification is not just about putting the pieces of the puzzle together in the right way, but it is also the picture that the pieces make up all together. The Light and desire are inseparable. The Light is the quality of bestowal that dresses into the desire. The “body” is the desire to receive pleasure. The “soul” is the form of bestowal that this desire assumes. It is written that everything depends on the desire. On the other hand, everything is created by the Light, and the desire is just an imprint of the Light. So how can this be? One form relative to another is called the Light against the Kli. The Kli of the Upper One in relation to the Kli of the lower one is considered the Light. We are talking about qualities that are relative to one another. The Upper One is one that bestows more, and is therefore called Light relative to the lower one. The lower one is the one that receives more and is therefore called the vessel or Kli. We are accustomed to vessels that are metallic or glass and which are filled with something. But in spirituality this is completely not the case. The quality of bestowal, which exists inside the vessel, is called Light. The quality of reception is the Kli. But all of this exists as qualities of the desire. We are always talking about the desire alone, and about its ascents and descents. Its higher forms are called Light, and its lower forms are called Kli. Therefore the Creator (Boreh) is called Bo-Reh (come and see), because we see Him inside our own Kli. The form of bestowal that is imprinted inside the Kli is called Light, the Creator. These are very important concepts because they correct us in the right direction, in order for us to cross the veil and enter the spiritual world by learning to relate to our desires correctly. They are all just different forms of reception and bestowal. We don’t know what Atzmuto is, the Light itself, . We can only talk about the forms it creates within the desire. Besides this, we cannot understand or feel anything. When I drink water, I don’t know what water actually is when it is outside of me. I only know how it is perceived inside my sensations and in my senses. This is the only thing I can talk about, and I can therefore describe the water as being wet, cool, sweet or sour. I can only describe it from the point of view of my own Kli. That is why we only talk about the Kelim and their impressions, the forms and sensations that are present within them. It seems to me that I go into the shower, turn on the faucet and enjoy the water streaming down on to me. But the faucet and the water streaming down on me, and the water that’s inside me when I drink it, are all my own Kelim. If we discern the concepts in the right way, then we will be able to read The Book of Zohar correctly. Everything we do in this world automatically follows our egoistic desires. We don’t realize that all we do 24 hours a day is serve our ego. We think that we enjoy at least an hour during the day, but we’re actually working for our egoism the whole time. This happens subconsciously. The only way to escape this situation is to convince ourselves that the most important work is that of a spiritual nature; that our role is to add to the point in the heart given to us from Above. This thought must constantly be pounded into our heads and we have to consistently check whether our actions are leading us towards this goal. How much you value the goal will define where you are heading. Even if you’re not capable of fully achieving the goal, at least you’re trying. Did you build the right environment – a support system that constantly reminds you of the importance of the spiritual goal? If not, then your life will vanish without you ever having achieved any results. Merely being present at a lesson and being in the group doesn’t mean a thing. What’s important is not to become a lazy “fan” who watches the game from the stands and calls himself a sports lover. What Kind Of Love Will Prevail? 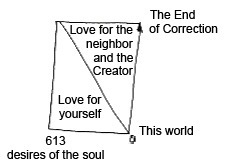 Your will to enjoy is split into two parts: the uncorrected part (love for yourself) and the corrected part (love for the Creator or your neighbor). We advance from this world to the End of Correction by nurturing the corrected part and reducing the uncorrected part in all the desires of our soul, from the first to the 613th desire. If our level of love for ourselves is at 100%, but we still talk about loving the Creator, that’s what we call religion. People don’t even realize that their love is completely egoistic and they don’t have a critical approach, which is the left line. If a person acquires a left line, then he starts doubting whether he loves the Creator or not, and tries to analyze whether he loves himself or his neighbor and whether he even needs this kind of love or not. These discernments are made in the relationship to oneself and other people. If a person doesn’t receive support from his environment in order to be able to work with it, to invest his energy into the environment and receive the right influence from it, then the revelation of the left line can actually harm him on his spiritual path – his questions will steer him away from the spiritual path and bring him back to a common life. This happens when a person doesn’t try, by using all possible means, to connect with the group in order to gain a greater sense of the importance of the spiritual goal (to receive this importance from group), so that this goal will be higher than anything, including all earthly, egoistic goals. Only the value of “what’s more important” defines whether a person will stay on the spiritual path or will leave for a number of years or even several lifetimes, while leading a common life. “Is there a more important goal in life?” This is the question that every person will have to answer continuously throughout his life. If a person doesn’t get support from the environment, it will seem to him that there are more important things in this life other than love for the Creator, such as family, career, and the opinions of other people. He will get stuck on his way to the goal and will stand still until he gets enough fuel to move forward, either from suffering or from a new source of inspiration. A question I received: The Book of Zohar, the “Preface to the Wisdom of Kabbalah,” and Talmud Eser Sefirot all talk about the peak of the universe. So why is The Book of Zohar the most powerful? My Answer: No book was written from such a high level by ten Kabbalists, who represent sources of ten Sefirot. They all achieved the full correction of egoism, passed all 125 degrees, and were united as one in Malchut of Infinity. They annulled themselves so fully on all the degrees, starting with the lowest degree to the highest, that they were able to transmit a pillar of Light to us from Infinity. Now this Light is in front of every person, and every person can receive it through The Book of Zohar. No Kabbalist or group of Kabbalists in the history of Kabbalah, starting with Adam and on to our times, throughout 5770 years, had an opportunity to do anything like this. The authors of The Book of Zohar, the ten Kabbalists, representing the ten primordial Sefirot, performed a correction from this world to the highest world. Therefore, they are able to give us the force that can correct everything. This is why The Book of Zohar is being revealed particularly during our times, when egoism and crises are being revealed in our whole civilization. This is also the reason that it was prohibited to reveal and study The Book of Zohar in previous generations. Question: Baal HaSulam’s regular texts don’t leave us room to get confused, but when we read The Zohar with his “Sulam Commentary” without your clarifications, we begin to imagine images of this world. Why is that? My Answer: This depends on one’s training and practice. When I read the Torah, I don’t perceive it as a historical novel. The whole Torah talks only about a person’s inner world, the spiritual world that is within me. My spiritual world is formed by my desires for bestowal; they give me a perception of a new world. Right now I also perceive all of reality within me. What I feel in my mind and feelings is called “this world.” However, since my intentions are egoistic, “this world” that I perceive is a limited, defective, and only a temporary state. If I change my intention from reception to bestowal, then I will perceive the spiritual world, which is boundless, perfect, harmonious, and an eternal state. The Book of Zohar is meant for those who desire and are ready to change their intention from reception to bestowal. It is now being revealed to all the people in the world who feel a need for this, and the global suffering will cause everyone else to feel a need for this. Question: Why do the authors of The Zohar, the Torah, and the Talmud confuse us by describing our world instead of the Upper World, and instead of spiritual actions, they seem to describe corporeal actions, such as jobs in the Temple and the history of the Israeli nation? Why do they use this medium to tell me about what is happening in me? My Answer: By confusing you, they direct you to change your perception, to start perceiving through the intention to bestow instead of the intention to receive. This world, all of history, the Temple, the laws of the Talmud, the Sefirot and the worlds do not exist. They are all parts of my desire. However, in order to change this desire from the intention to receive to the intention to bestow, you need to perceive it and the precise images in this form. You have to make efforts in order to see the world through the quality of bestowal and to transfer yourself from one type of perception to another. It is precisely the effort that brings about changes in all of us and brings us to a completely different, previously unfamiliar perception. There is nothing artificial about the perception of this world or the spiritual worlds. All their images are created in us by the natural, direct interaction of the Light and the desire (the vessel, Kli). Nothing else exists except these two things. Question: After all is said and done, how do we really attune ourselves to studying The Zohar? 1. Constantly try to feel that everything in this world and everything described in The Zohar is inside of you. Everything happens only within you. 2. Remember that everything written there is about you and your qualities. 3. Try to find the qualities inside you that are named by the words of the text of The Book of Zohar. Which of your qualities do you relate to the words “flood,” “Creator,” “creature,” “Noah,” “wicked,” “righteous,” “sons of Noah,” “animals,” “ark,” “the waters of the flood,” “skies,” “earth,” and so on. 4. Who am I? This is something I don’t know either. I have to expect to reveal myself, to reveal another world and everything filling it. Everything will be new. I need to be ready for any revelation because right now I exist in a lie and in the dark. There is a hollow space inside of me, and inside of which I build a new world from my searches and revelations, like a baby gradually pieces together a picture of our world from his impressions. The Zohar is a revelation of our true state. This revelation occurs to the extent that we are similar to what is concealed, to the degree that we acquire the quality that is similar to the concealed, spiritual world. The Book of Zohar becomes revealed to us to the extent that we acquire the intention to bestow, and if we don’t acquire it, the book will forever remain a mystery. Kabbalah advises us to check: do we desire to bestow? We should check whether we have the aspiration to unite all the desires for bestowal of all of our friends. Their unified desire will be the revelation of the Upper Degree – the Creator. Each of us, regardless of where he is, should rule out everything else and desire only to rise above our world, to unite and feel that we are all “one man with one heart.” This is the only way we can achieve unification and a mutual guarantee, and thus reveal the Upper World inside this quality.